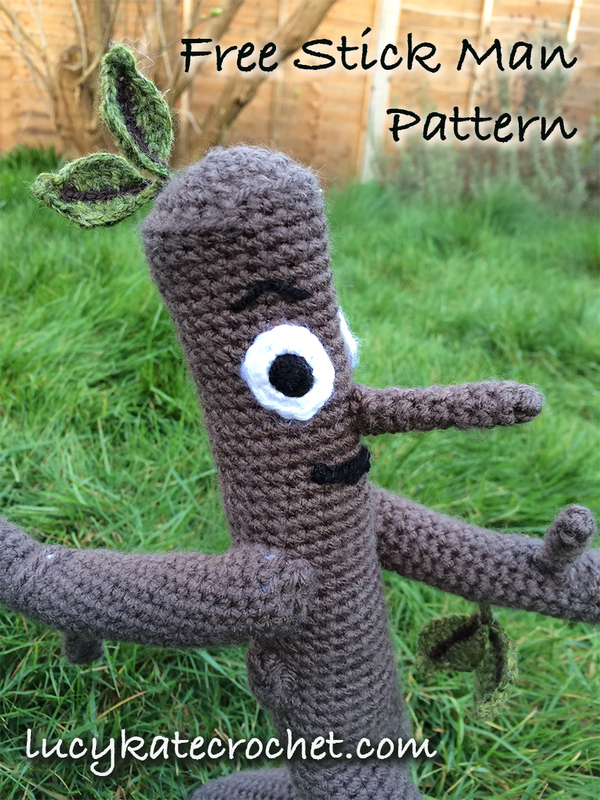 Welcome to my free crochet Stick Man pattern! 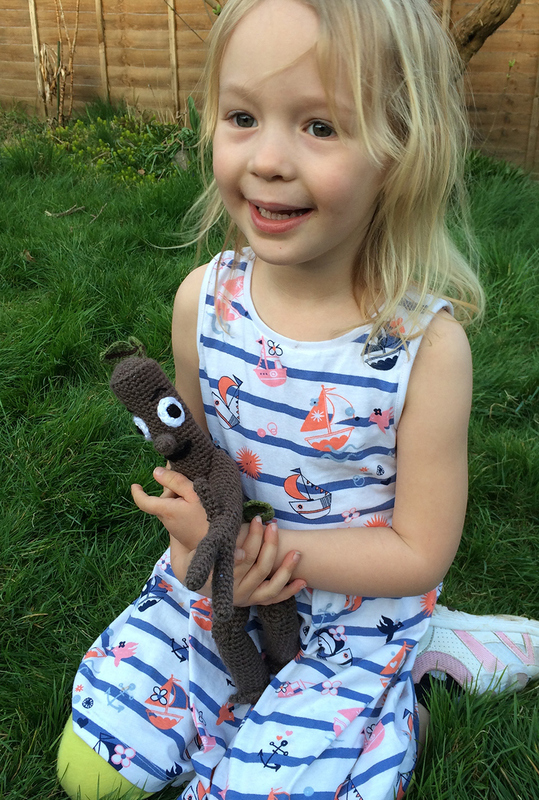 Teaching you how to crochet your very own Stick Man toy. This pattern is made predominantly in rounds, working from a magic circle. The main stitch used is a single crochet (US terms). The pattern will begin by being written in full terms, with abbreviations in italics. Thereafter the abbreviations will be used, once they have been established. The stitch count in each round is given in brackets at the end of the instruction. If you would like a handy abbreviation chart to check as you go along, you can find one here. 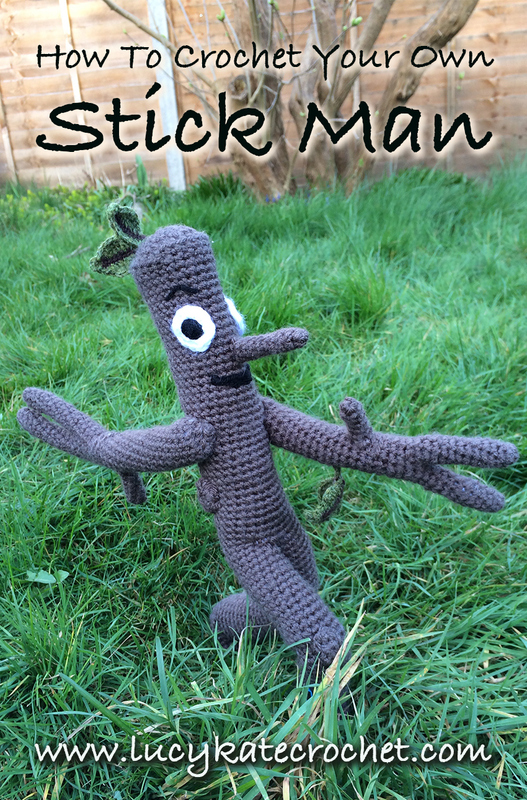 Your Stick Man Crochet Pattern and joining instructions are given below. However, his leaves were made using a pattern from another website. 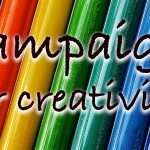 I have linked this in the leaf section below. 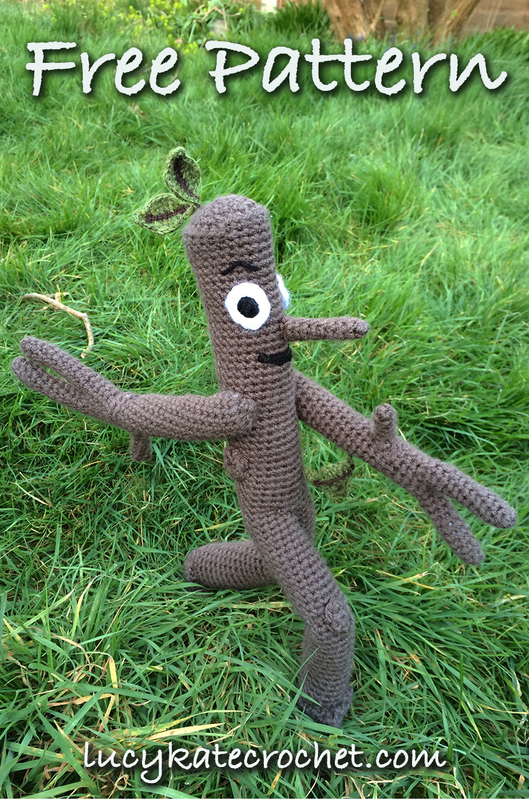 You are going to make your crochet Stick Man’s head, body and one of his legs, in one complete piece. He is a stick, after all! Start by working with your size 7 /4.5mm crochet hook and brown DK yarn. Make two single crochets in each of the six stitches. Make one single crochet in the first stitch, then two single crochets in the second. Repeat for the round. 1sc x 12 then chain 4 and join the chain across the body and into the first stitch of the round. 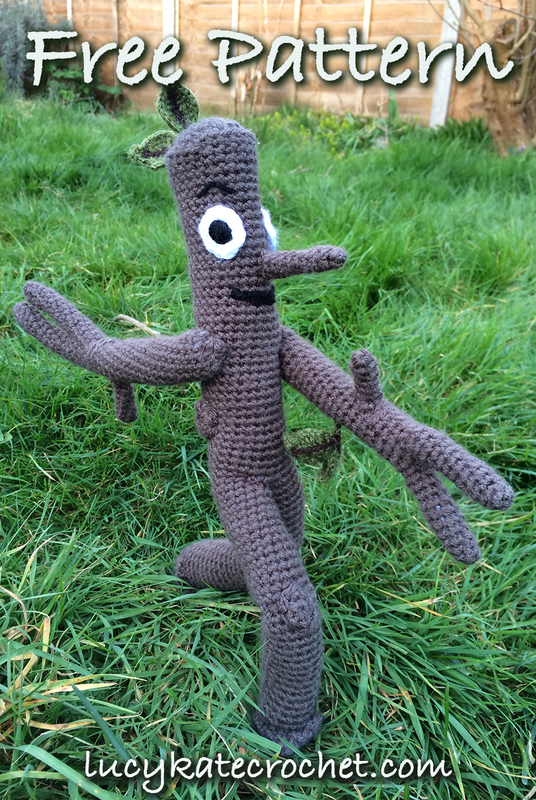 We will now be building the first of Crochet Stick Man’s legs. 1sc x 12 then 1sc into each of the 4 chains. Single crochet two stitches together (sc2tog) until the leg is closed. Then sew shut and leave a long thread for sewing on the foot later. Crochet Stick Mans second leg will be made with a new section of yarn, but attaching it straight into the gap left beside the other leg. Use your size 7 /4.5mm crochet hook and brown DK yarn. Start the leg by making a slip stitch into the corner stitch at the top of the first leg and chaining one. Then make 1sc into each stitch around the bottom of the leg and at the other open side of body. Make a magic circle of six stitches. Then put 2sc into each stitch. Slip stitch into the next stitch, cut off a long tail and tie off. Flatten your foot base so that you have 6 stitches on top and 6 underneath. Chain 2, then double crochet (dc) through the top and bottom sc, joining them together. Make 2dc into the next pair of stitches, then slip stitch into the side of the foot to complete. Make a magic circle of three stitches. Starting from the finger you just completed, and work a single crochet into the next stitch. Then make an sc into each stitch around the other finger, joining them together. Move straight back onto the previous finger. You should now have a ring of 12 stitches. Carry on working from here. Crochet Stick Man’s 3rd Finger! The final little fingers are to be made separately. Use your brown DK yarn and size 7 /4.5mm crochet hook. 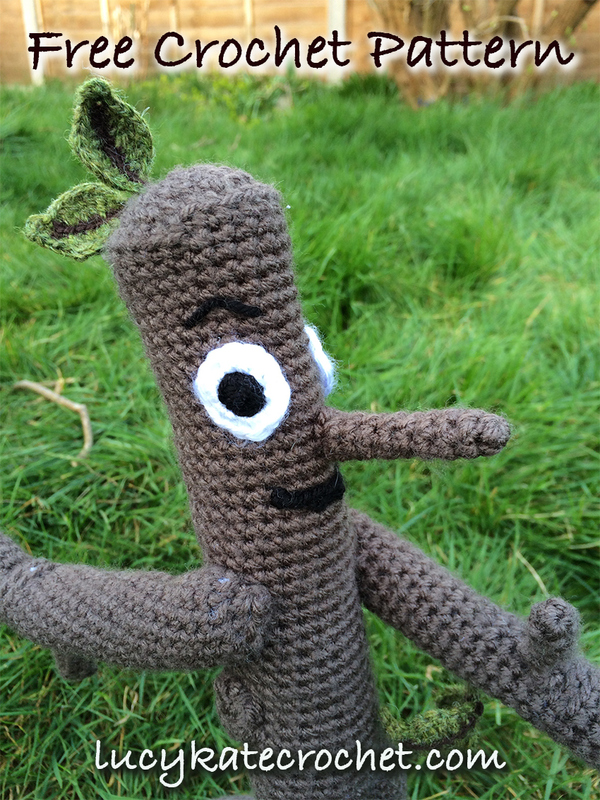 To make Stick Man’s crochet nose use your size 7 /4.5mm crochet and brown DK yarn. Thread your black DK onto a yarn needle, and sew through the centre of the eye. Weave back and forth through the centre and into each of the surrounding round 1 magic circle stitches, until he has a complete pupil. 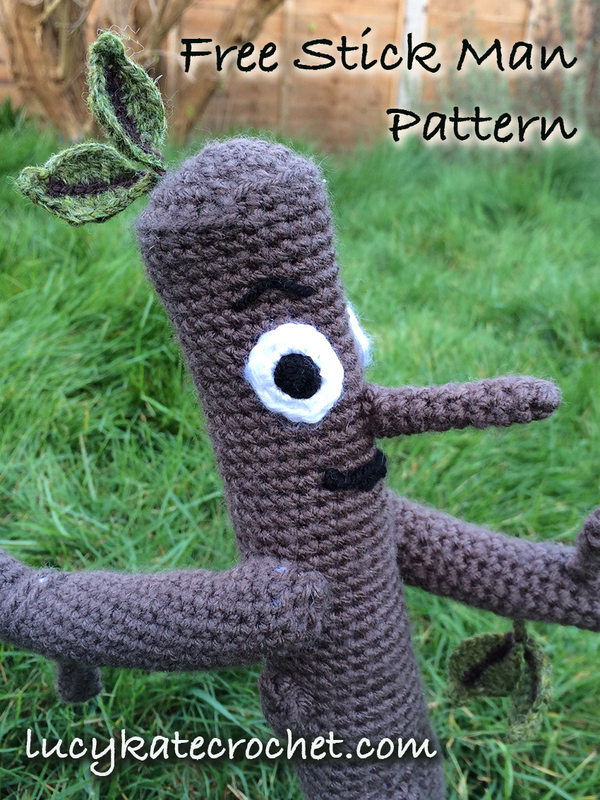 I made various attempts at the crochet leaves for Stick Man. And I have to admit, I fell flat. Very flat. I mean to the extent that I am not even going to share photos of my attempts with you, as they were unidentifiable as leaves. Amorphous green blobs, with strange wavy edges simply weren’t going to cut it here. So I went back to my very favorite crochet leaf pattern and used that instead. So to make your crochet Stick Man’s leaves, you will need to pop over to Attic24 here. The triple layer flower pattern has a leaf tutorial at the bottom of the page. 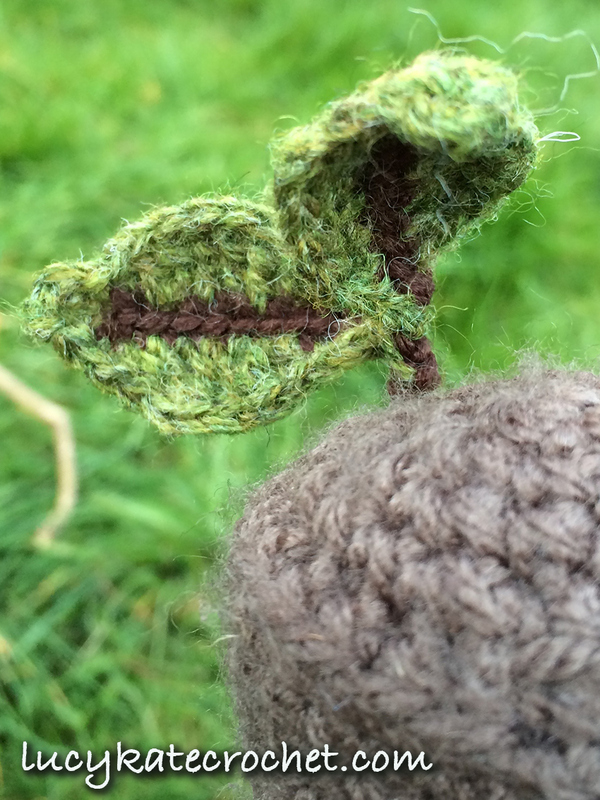 Follow it using a 2.5mm crochet hook, brown DK yarn for the spine and a green DK yarn for the rest of the leaf. If you haven’t come across Attic24 before, then I highly recommend a good snoop around the site while you’re there. It’s brilliant. 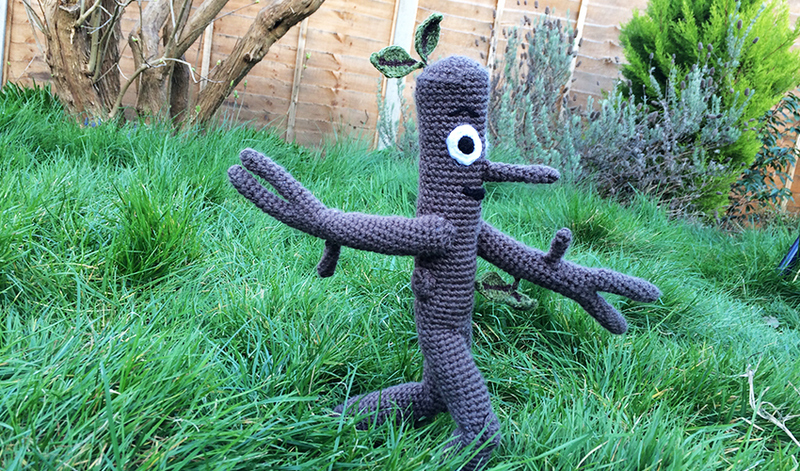 You are now ready to join your Stick Man crochet toy together. First few the feet onto the body. 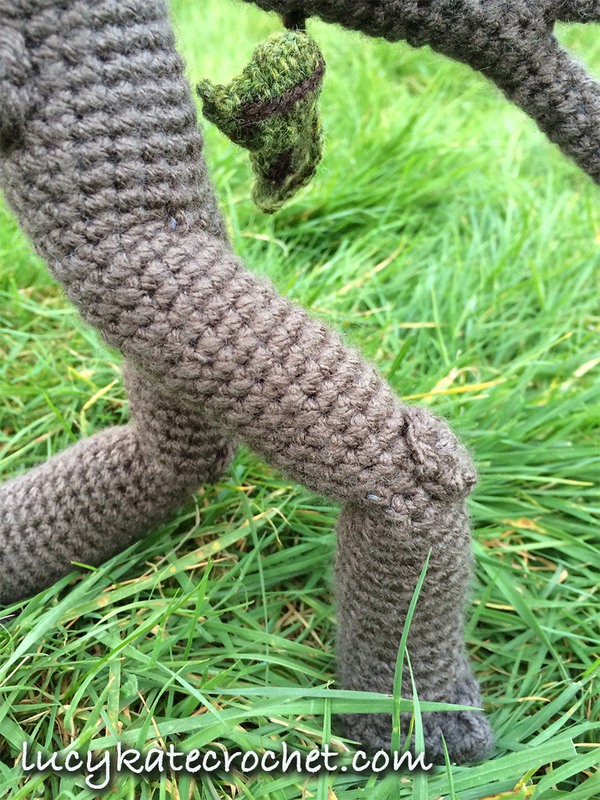 Using your brown yarn and needle, weave around the base of the leg and attach the foot, toes pointing forwards. Next sew the fingers onto the arms. One on the bottom, one on the top. Then sew your leaves on. A pair on top of his head towards the back, and another pair underneath one of his arms. 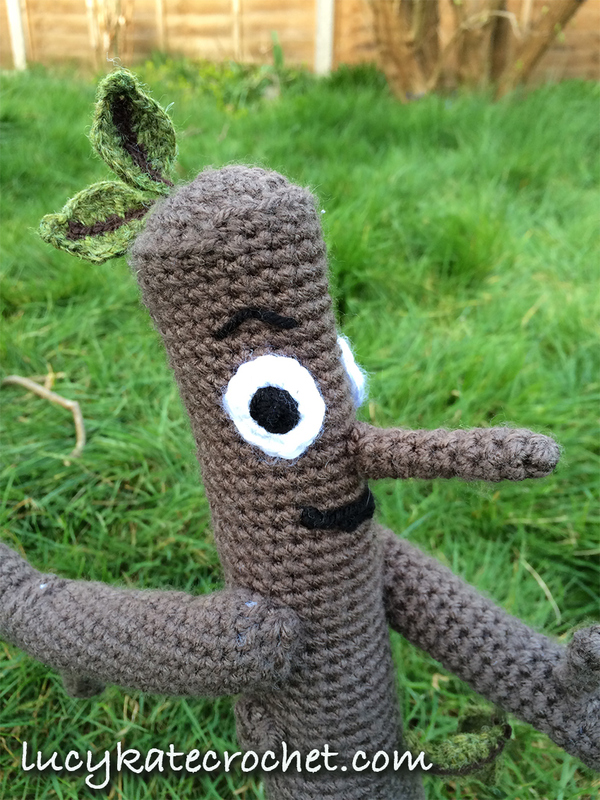 Use your crochet hook to pull the loose threads helping to secure the leaves of your Stick Man crochet toy in place. Finally pin the arms, nose and eyes in the position you would like them in. Sew the eyes on using white yarn, working carefully around the circumference of each one. Remove pins as you secure each side to keep them level and in place. 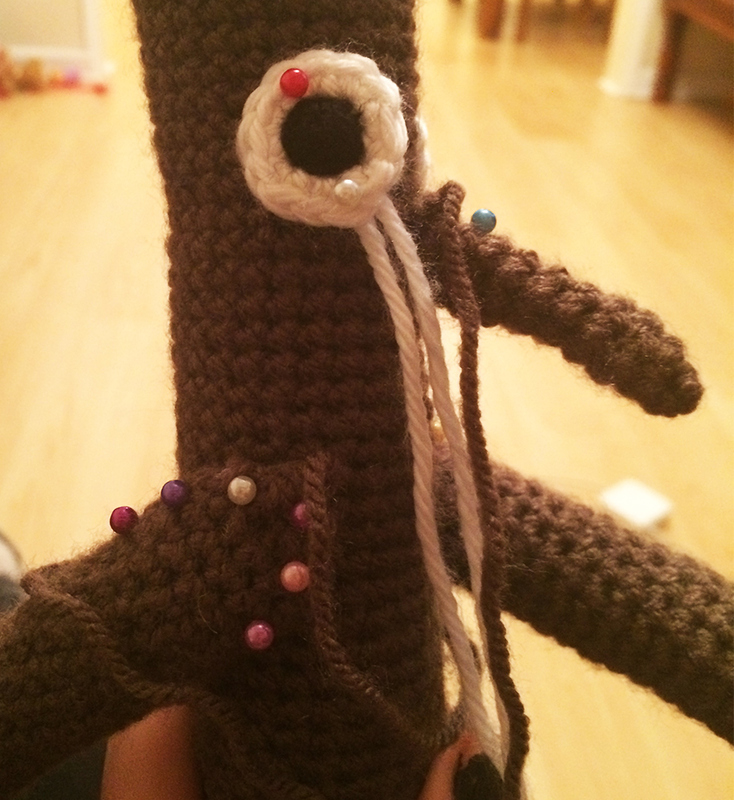 Then using your brown yarn, very neatly sew the nose onto the center of the face. Sew through each single crochet stitch in the final round to ensure that it is tightly joined. 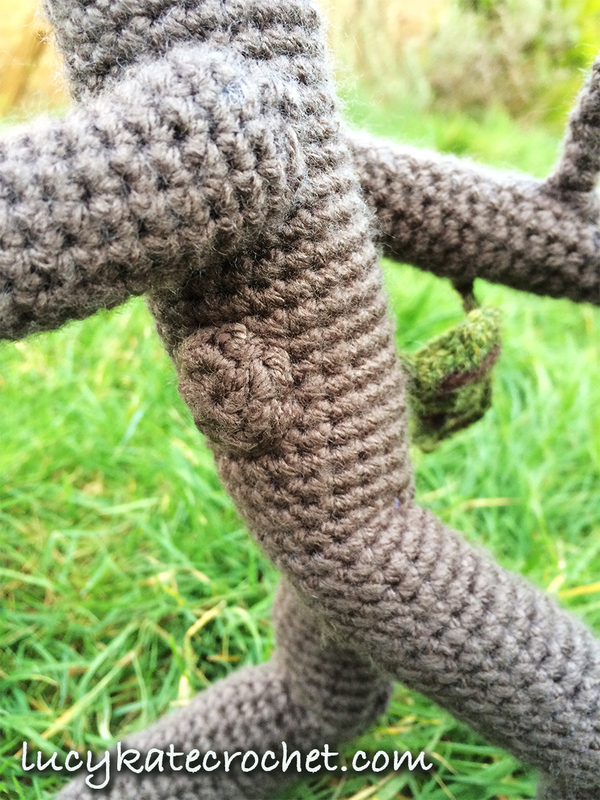 Last of all, sew the shoulder of the arm only your Stick Man’s crochet body. Check the angle of the arm as it’s a static fix, so you won’t be able to move them after you are done. 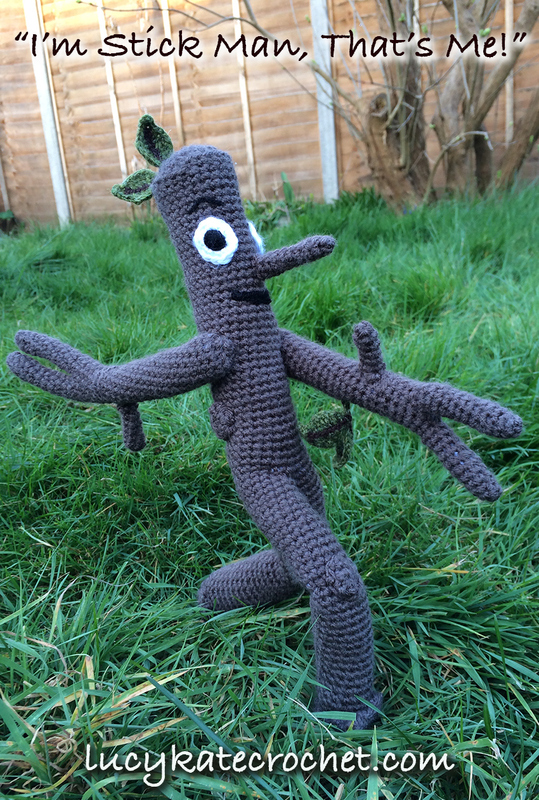 I hope you enjoy making your Stick Man crochet toy as much as I did. 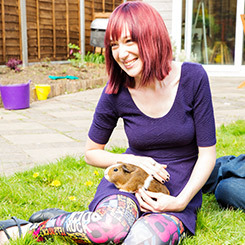 When you’ve finished, why not share a photo of him on my Facebook page or via Ravelry! The pattern requires in UK (metric) terms a 2.5mm and 4.5mm crochet hook. In US terms these are a size 4 and a size 7. In UK terms a 2.5mm is confusingly also sometimes called a size 12!